Nicknamed "Wukong" , or Monkey King, the DAMPE satellite was launched into orbit in 2015. The satellite is equipped with instruments that can observe the direction, energy and electric charge of high-energy particles in space. In this study, the DAMPE Collaboration team reported direct measurements in the energy range 25 gigaelectronvolts to 4.6 teraelectronvolts with extremely high energy resolution and low background. The team also find a spectral break, which is an unexpected drop in the number of cosmic-ray electrons and positrons seen at high energies, at about 0.9 teraelectronvolts, confirming previous indirect measurements. Since 2008, scientists have found "abnormal" phenomena within the one-teraelectronvolt cosmic rays, and some of them believed that such abnormality may be related to dark matter, Yizhong Fan, vice director of the scientific application system of DAMPE, told Xinhua. It is believed that only around five percent of the total mass-energy of the known universe is made up of ordinary matter, substances that we know, and the rest is dark matter and dark energy. Because dark matter does not emit or reflect enough electromagnetic radiation, finding it has proved to be a great challenge to researchers. It is still hard to know whether dark matter is a particle, a field or a misunderstanding of how gravity works. 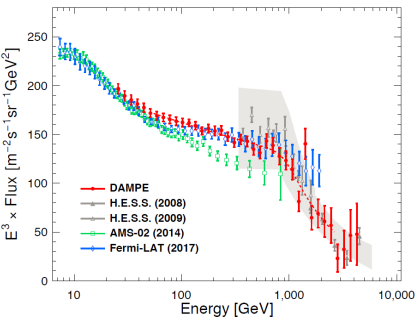 "The DAMPE satellite is starting to directly measure the properties of cosmic rays at energies that were inaccessible to previous measurements, so we are entering unknown territory -- we do not know what it will find," said Ziemelis. "But whatever it finds will be new and contribute to our understanding of high-energy processes in our galaxy, regardless of whether they involve dark-matter particle annihilation." 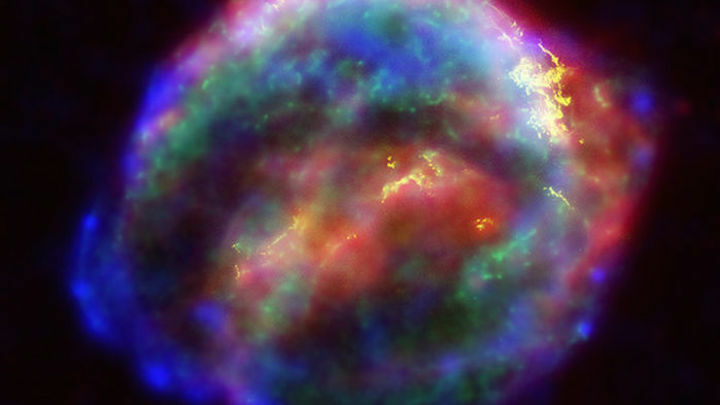 The remains of Kepler’s supernova, as seen in a composite image produced by NASA. As part of the hunt for dark matter, China’s Dark Matter Particle Explorer mission tracked particles related to cosmic rays produced by supernovae. A long-standing challenge in physics has been finding evidence for dark matter, the stuff presumed to make up a substantial chunk of the mass of the universe. Its existence seems to be responsible for the structure of the universe and the formation and evolution of galaxies. But physicists have yet to observe this mysterious material. Results reported today by a China-led space science mission provide a tantalizing hint—but not firm evidence—for dark matter. Perhaps more significantly, the first observational data produced by China’s first mission dedicated to astrophysics shows that the country is set to become a force in space science, says David Spergel, an astrophysicist at Princeton University. China is now "making significant contributions to astrophysics and space science," he says. 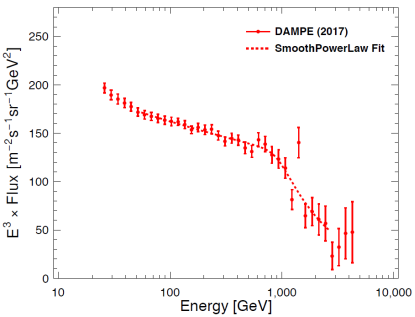 In its first 530 days of scientific observations, DAMPE detected 1.5 million cosmic ray electrons and positrons above a certain energy threshold. When researchers plot of the number of particles against their energy, they’d expect to see a smooth curve. But previous experiments have hinted at an anomalous break in the curve. Now, DAMPE has confirmed that deviation. “It may be evidence of dark matter,” but the break in the curve “may be from some other cosmic ray source,” says astrophysicist Chang Jin, who leads the collaboration at the Chinese Academy of Science’s (CAS’s) Purple Mountain Observatory (PMO) in Nanjing. The DAMPE results appear online today in Nature . More data will be needed to confirm what DAMPE is possibly seeing. But there is good news on that front. "We expected a 3-year life for the satellite," Chang says. But given the smooth functioning of the spacecraft and its instruments, "we now expect it to last 5 years," he says. That will allow the satellite to record more than 10 billion cosmic ray events. Fan Yizhong, a mission astrophysicist also at PMO, adds that DAMPE's observations will complement those of other space- and ground-based instruments to ultimately clarify whether there is a connection between the anomalous signals and dark matter annihilation. The DAMPE collaboration comprises four institutes under CAS, including the National Space Science Center in Beijing; also involved are the University of Science and Technology of China in Hefei, the University of Geneva, and Italian universities in Bari, Lecce, and Perugia. The satellite has been named Wukong, after the Monkey King character in the 16th century Chinese novel Journey to the West . 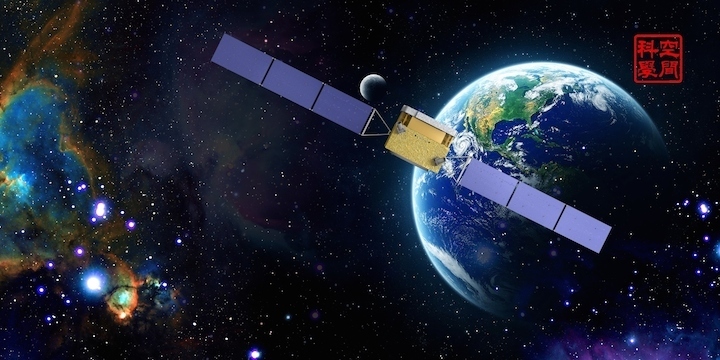 DAMPE was also China's first mission dedicated to astronomy and astrophysics, though it was joined in space in June by the Hard X-ray Modulation Telescope, intended to observe x-ray and gamma ray emissions from black holes, neutron stars, active galactic nuclei, and other phenomena. Even if DAMPE's data don't resolve the dark matter riddle, Spergel says, "These measurements will inform our understanding of cosmic ray acceleration [and] will tell us about the physical processes in shocks around supernova and the physics of pulsars."